currently a Gundam Seed desktop pic. Usually I have all icons grouped into "catagories" like game shortcuts in one corner and downloading apps and folders in another, but lately been using Workshelf to clean things up a bit. My monitor died so I'm stuck with an old 15". So keeping it neat is the only thing keeping ME sane. Sorry to hear that Lacien.I lost my father late last year,although we were not close,at all. and my desktop is filled with completly unorganized shortcuts to just about every program i have all over the place, thank god for higher screen resolutions or i might have to *gasp* organize them somehow!!! Yes, you have a point. That's what I meant... the reason windows has so many bugs is because they try to eliminate DOS from it, and without DOS windows cannot exist. Linux has much less errors because it pretty much embraces DOS and DOS-like interfaces. I never really looked into it... but damn it must take a while to compile a whole OS. It takes my PC like 10-15 minutes to compile MAME, and I don't have a crappy PC by any means. You know, i was thinking the same thing. I was taking a look at the windows PARTIAL source list of files, and all i was thinking was damn that must take forever!! then i look back at mame and count my blessings. Text: THIS SHI AIN'T ROCK IT'S ROXY "Taken after the 70's glam band ROXY MUSIC"
"This Isn't Rock! It's Roxy"
Damn... all you people are running at really low res. 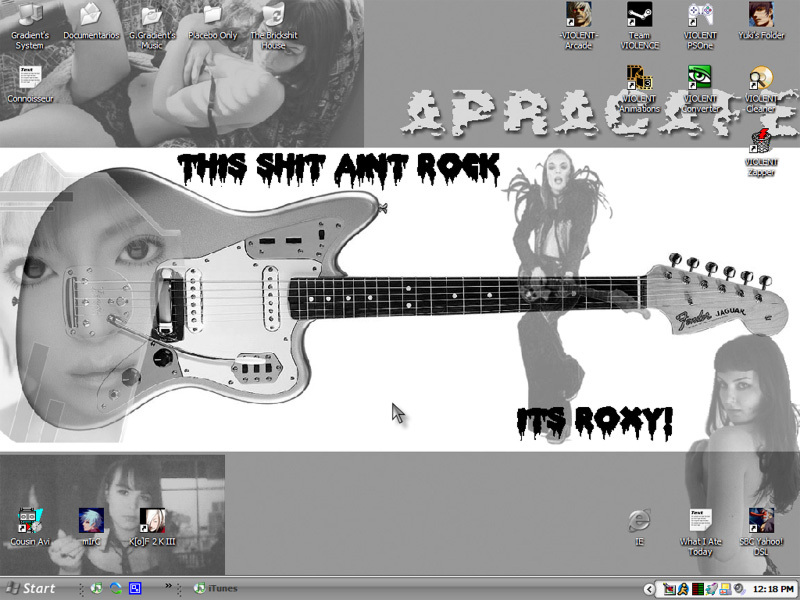 xp pro, no themes, kr kde3.2/fc1/vmware. 1. I don't like high resolution because almost EVERYTHING is incompatible with it.